IgE and allergy are words that often are discussed hand-in-hand. “IgE allergy” is a specific disease process and is NOT an intolerance. 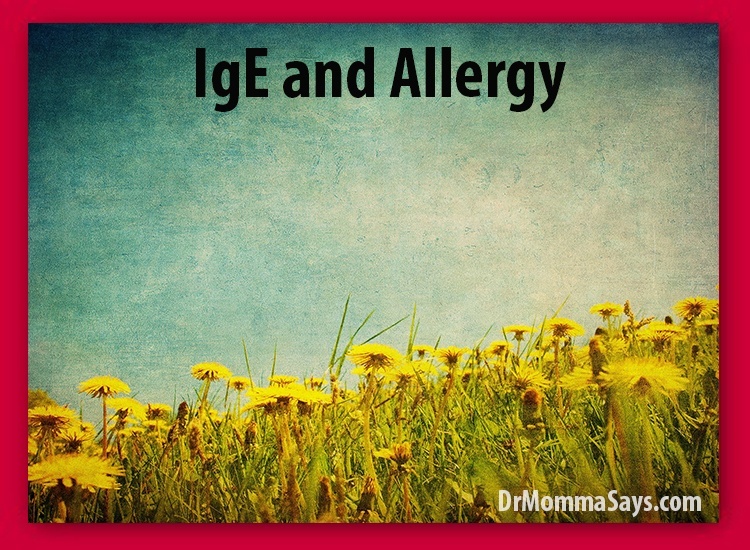 When physicians evaluate allergies, they usually measure IgE; however, people do not know what IgE is! Let’s start with some basics. “Ig” is an abbreviation for Immunoglobulins (Imm-YOU-no-GLOB-you-LINS). We do not pronounce “Ig” like we learned in school; we simply say the letters separately: I–G. Immunoglobulins are antibodies made by our immune systems to fight foreign substances. Some of the things that our immunoglobulins (antibodies) attack include bacteria, viruses, fungus, animal dander, pollen, medications or cancer cells. Antibodies react only to a specific foreign substance. For instance, antibodies for the flu virus do not fight the virus that causes chickenpox. We need immunoglobulins because if we do not make enough, we suffer from repeated infections. Our bodies make immunoglobulins (antibodies) which cause allergy disease. Sometimes the antibodies attack our own normal tissues. When our antibodies attack our body, an Autoimmune Disease occurs. Although most antibodies fight to help keep our bodies strong, sometimes antibodies cause another disease. Immunoglobulins perform different tasks; therefore, it is extremely important to understand their differences. IgA: These antibodies, found in areas with a lining that produces mucus, protect surfaces of our body that are directly exposed to outside foreign substances. Examples include ears, eyes, nose, throat, lungs, and stomach. IgG: These antibodies, found in all parts of our body, fight bacteria and viruses as well as other foreign substances on a daily basis. Although the smallest sized immunoglobulin, they represent 80% of the antibodies that we make. IgM: These antibodies, found in the blood and lymph fluid, respond to infections first and begin the process of protecting our bodies while other antibodies are being produced. IgE: These antibodies, found in the skin, lung and in areas with a lining that produces mucus, trigger the well-known allergic reactions. IgD: Rarely talked about because it is not clear what they do! So now you understand that IgE and allergy remain linked together because the Immunoglobulin E causes the allergic reactions. Traditional blood allergy testing measures amounts of IgE; however, people with no allergic disease show minimal amounts of IgE. This test serves as a marker that allergic disease is present but should be combined with further history, examinations and testing for a more accurate diagnosis. Some doctors measure the amounts of IgG, but this test fails to evaluate true allergy disease. IgE and allergies remain linked while IgG reactions represent an intolerance. The skin represents a major area for IgE to collect; therefore, one of the best ways to determine allergy severity includes performing skin prick testing. A small amount of the suspected allergen (food, pollen, dust, mold etc) is placed just under the skin while monitoring reactions. A red area around the site may develop, but the amount of swelling that occurs is most important. Once IgE forms, it triggers a special series of steps leading to an allergic reaction. These immunoglobulins move through the body and interact with cells that release histamine. (HIS-tuh-MEEN). Histamine is the chemical that causes the production of extra mucus and many of the symptoms that we associate with allergies, so it makes sense why we treat our symptoms with medications that are called ANTI-histamines. We really need histamine to stop doing the ugly things that lead to our allergy symptoms! It is also important to know that many other chemicals are released during the allergy reaction but targeting histamine is very helpful. This immunoglobulin plays a major role in the development of allergic asthma, allergic nasal disease, allergy-induced ear infection, many types of sinusitis, food allergies, hives and chronic allergic skin rashes. It is also the key agent in developing severe reactions to medications and bee stings that require the use of an Epi-pen injection. IgE and allergy represent the disease that many of us think about with true allergic disease. Although not exactly the same, feel free to use terms IgE and allergy interchangeably! My other posts delve into the methods of diagnosing food allergies, identifying false food allergy beliefs, and discussing the differences between food allergies and food intolerances. I also post informative information about how to determine if you have allergies and understanding the best nasal allergy treatments. If you are interested in getting updated information with parenting and healthcare tips, please consider subscribing to my blog to avoid missing a post! This is a great break down! I have started working with a new allergist this year, after dealing with a crazy list of allergy-like symptoms my entire life. He also explained the breakdown… as I have an odd reaction to progesterone, soy, and gluten that manifest primarily as asthma and horrible hives and bruising… this is excellent! Thank you for this feedback! I work really hard to try to share information that helps explain what physicians are thinking and assessing. Sometimes it can be too detailed. I love that you were able to digest it and that it was helpful. And glad you have found someone to help you on the way to improved health!